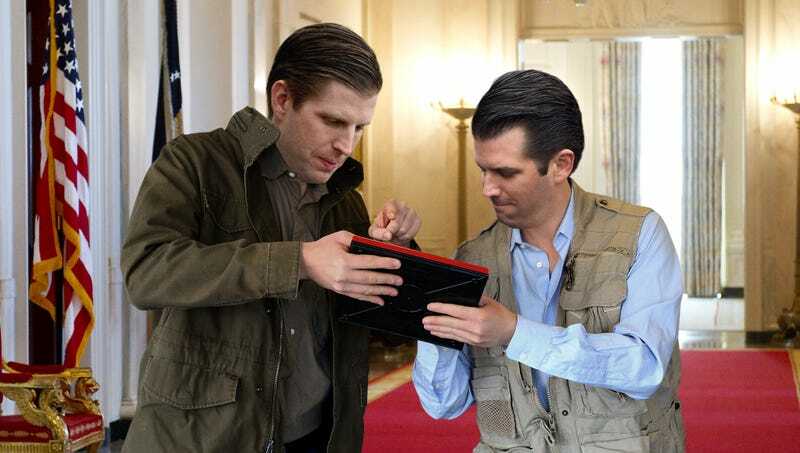 WASHINGTON—Insisting that they had taken every measure to keep the message “extra top secret,” the Trump boys reportedly spent Wednesday defending their decision to send Saudi Arabia plans for a cool missile using their personal Etch A Sketch. “We spent, like, a million hours making that rocket look super good, so we had to send it to our friends in Sunny Arabia [sic] as soon as we could,” said Eric Trump of the jagged rendering of an airborne missile with what appeared to be a lightning bolt on its side, noting that they had done everything they could to ensure the privacy of the plans, which included labeled stick-figures of both brothers as well as a dog that they hoped their dad would buy for them. “No one even gave us a government Etch A Sketch. Besides, there’s this awesome ninja in there that would have been way too hard to redo. Plus, we made sure the prince knew to shake it up when he was done, just so it’s all super safe.” At press time, the Trump boys were denying responsibility for the recent leak of Lite-Brite plans for a new baby brother.